The processes used to make lambic, especially its spontaneous fermentation in open tanks, reflect practices that existed long before most of the techniques used by modern brewers. This is not to say that this is a primitive beer, in fact, lambic is one of the most sublime and complex beer styles one can try. But tradition and now the law has made of this Belgian ale a lens through which one can peer back into the history of brewing both in brewing methods and in the qualities of the final product. To drink a well-brewed lambic is not just to taste a great beer but to take a trip back through time. Two aspects of the production of lambic make it unique today. First and most famously is its spontaneous fermentation. Lambic brewers do not pitch a carefully managed yeast strain from the lab in their wort as do most brewers today. Instead, they leave their wort open to the air and invite, even direct, their region's microorganisms into the sugary feast. The result is a wild, funky, sour beer that varies wildly from batch to batch. Second, after fermentation and barrel aging the various batches are compared and blended. Often old and new brews are combined giving lambic its characteristic depth and complexity. It is impossible to define the mix of wild yeasts and bacteria that are used to ferment lambic because it changes from batch to batch. The other ingredients are more precisely prescribed and in their way as interesting. Like many other Belgian ales, lambics contain a minimum amount of unmalted wheat. This provides some heft to the body, something not always shared by other soured beers. The hops used are stale. This is why there is practically no detectable hops quality in lambics, stale hops lose the more common traits of the herb but retain its preservative qualities. Many lambics also contain fruit. To the initiated lambics can be startling. The spontaneous fermentation creates a beer unlike any other in its sour, funky, and bright flavors. Beneath these in-your-face flavors lurk dusky, earthy notes that bring a complexity to the beer that keeps it interesting. Garrett Oliver describes lambic as a riot of flavors and we do not know of a better way to put it. Fruited lambics tend to be a bit less complex though no less enjoyable as the sour qualities of the beer support and enhance the flavors of the fruit or berries that were added to the fermentation tank. As a companion to food, we find it helpful to think of lambic like champagne. Lambic without fruit is much like dry champagne while the fruited ones are a lot like sweet champagne. If that analogy fails for you try thinking of lambic as the ultimate palate cleanser, a sour sorbet. 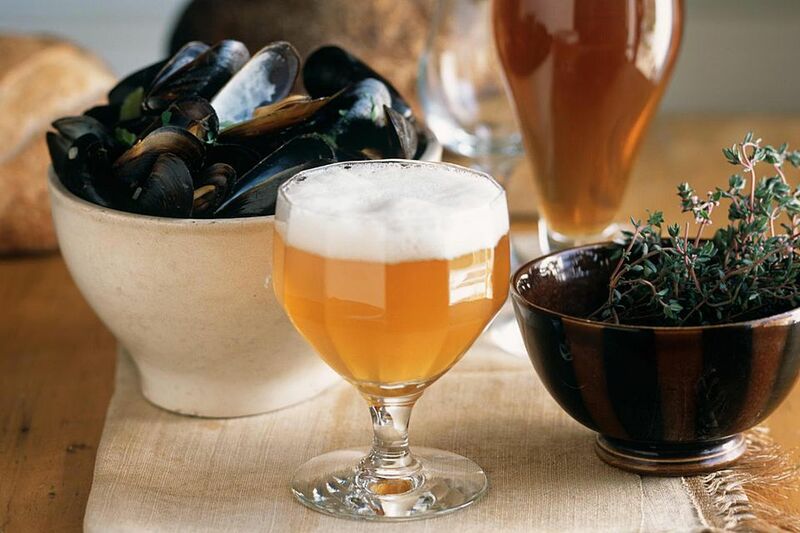 From this approach, it's easy to see that there are a few foods that cannot work with lambic. It can be particularly good with salads and sweets but it can be quite good with cream sauces or Indian food. If you like lambic you will like lambic with almost any food. Gueuze - A lambic made by blending old and new batches. Kriek - This word literally means cherry but in this case, it is a lambic fermented with sour cherries. Framboise - Like kriek, this is a raspberry lambic. This is by no means an exhaustive list of the words you'll stumble over as you study this interesting style but it will get you started.